Late summer is the season when the energy of these organs becomes more active. The entire body depends upon the functioning of the stomach for its nourishment. This organ does not like dryness it prefers moisture. Eating, exercising and body heat effect the meridian of this organ. The color of the lips, eyelids and the muscles indicate the condition of the stomach. (the muscles of the breast, ovaries, esophagus, fatty tissues and the arms and legs). Too little gastric juices will increase the growth of bacteria that may cause irritation of the stomach walls. This condition may produce too much mucous throughout the entire system. This decrease in digestion strength and the ability to assimilate food properly, further increases the production of mucus. The spleen is the principal organ of digestion. Spleen health is associated with the ability to taste food and its condition is indicated in the color and texture of the lips. The center of the spleen meridian is in the Pancreas and includes the functions of all the organs that secrete digestive enzymes such as: the stomach, gall bladder, small intestine, mouth, reproductive organs, glands and the cerebral cortex. Wanting to take frequent naps, due to lacking gastric juices. is caused by not chewing food well and consequently, not digesting properly, so there is a lack of perseverance to thoroughly assimilate things. The pancreas is an organ of secretion that produces pancreatic juices that are mildly alkaline as well as hormones and insulin. Blood sugar levels are too low when insulin secretion is not constant, the pancreas is producing too much insulin, or the liver is too weak to accomplish its work. This condition is the result of eating too many simple carbohydrates (refined flour and sugar). Hypoglycemia leads to constant cravings of yin food such as sweets, candies, alcohol and coffee. Type 2, also called adult onset diabetes. Dr. Klaus Schwartz, MD. Phd, conducted a lifetime of research and in his studies discovered that Chromium is a very important factor in the human body, because it is also essential in regulating the blood sugar metabolism. According to Dr. Schwartz, chromium is present in whole grains, but almost all of it is depleted in the refining process of flour products. It has an accumulative effect in that, the body is able to store it. We also get plenty from our mother at birth, if she has a good reserve herself. The problem is that, in the last few hundred years or so, fewer and fewer people eat a whole grain diet. So even at birth, we are getting lower amounts of chromium in the body to start with. Research seems to indicate that this may lead to an increase in the incidence of diabetes among younger people. Years ago, many people lived to 60 or 70 years of age before they exhibited signs of diabetes. Today, it is common to see people with this condition in their 40's. In fact, the adult onset of diabetes is even beginning to appear in children 5-10 years old. Acute pancreatitis occurs suddenly and last for a short period of time, usually resolves. Pancreatitis occurs when the body is attempting to burn away accumulations in the system caused by a diet of excesses. The body wants to clean up before the condition becomes serious. Chronic pancreatitis does not resolve and result in a slow destruction of the pancreas. The cause is drinking to much alcohol and/or a diet of excesses. It is common for the pancreas to grow tumors benign or malign. "In this time of the year energy starts to go down until becomes very condensed by late autumn. To get our body to become used to the colder weather we need to begin to adjust our diet by including in our meals root vegetables and squashes. The products of the earth during this time of the year are beautiful in colors and have some natural preservatives quality and can be stored for several months. We have to adjust our cooking by introducing more rich tastes and styles, with longer cooking time, such as bean stews, sweet rice and mochi, hot amasake and purèed squash soups. 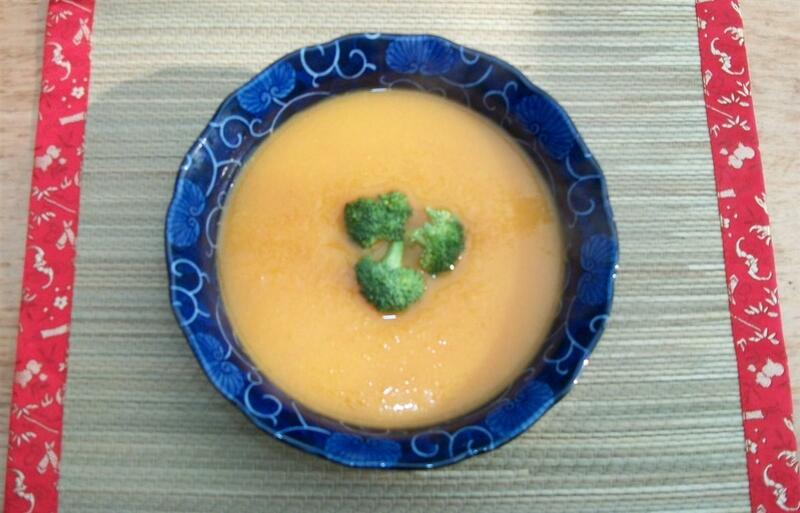 The food we enjoy in cooler weather, such as tempura, fermented foods and long-cooked stews and soups with root vegetables and squashes produces a warming effect on the body." Cut the squashes in ½ and remove the seeds, cut them up, remove the skin of the Kabocha. Cut the pulp into chunks and place into a soup pot, add all the other vegetables. Add enough water to cover the vegetables, Cook until are soft to the touch, ½ hour or more. Remove from heat, put all the ingredients in a food processor, retaining some of the water, process until creamy, add liquid as needed for the right consistency. Return the puree in the pot add a few pinches of sea salt. Stir, adjust the salt. Bring to a boil, simmer for 10 minutes stirring often. Serve. Cook rice in 4 cups of spring water for 45 minutes, let it cool down. Cut the sheet of nori in half. Put one piece each of carrot, cucumber and avocado in it and roll the nori around it using a sushi mat. Continue to roll the nori sheet until all the vegetables are finished. When the rice is cool, wet the sushi mat in water and put it on a cutting board. With wet hands, put rice in the sushi mat in a thin layer, but only cover one half of the mat. Then, with the fingers spread a small portion of umeboshi plum paste in the center of the rice, along the part where the nori roll will be placed. Roll the sushi mat in a way so the rice covers the entire nori. Press with the hands the rolled up sushi mat and fix the end pieces. Unroll the mat. You will have a little tube of rice. 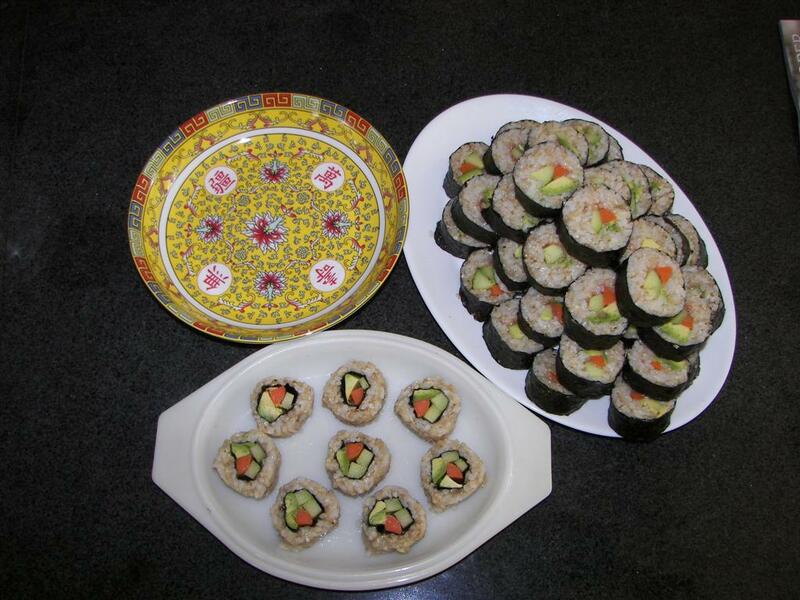 Roll it in a plate covered with the sesame seeds. Cut into one inch pieces using a very sharp knife. Serve. 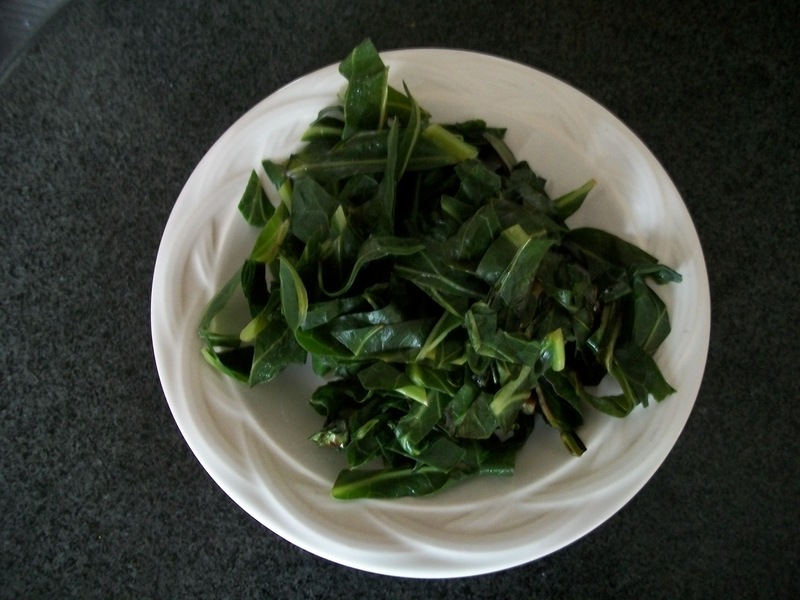 Boil spring water in a pot, put a 3" long piece of Kombu sea vegetable into the pot, cook 5 minutes and then remove it. Put the broccoli into the boiling water. When the water returns to a boil, remove the broccoli with a slotted spoon. Put the brussel sprouts into the boiling water, let them cook until a fork goes through them easily, but not mushy. Remove them and return the water to a boil. Put the carrots in and cook for 1 -2 minutes after the water comes back to a boil. Serve. Break up the leafy vegetables with your hands. Cut the radishes into thin rounds. Cut the cucumber in half, remove the seeds with a small spoon, slice very thin. Place everything into a bowl, add a few pinches of salt to taste, and mix well. Cover bowl with a smaller flat dish, and place a weighted object (heavy jar, rock, etc.) on top of the plate to press the salad mixture. Let it stand for at least one to two hours. 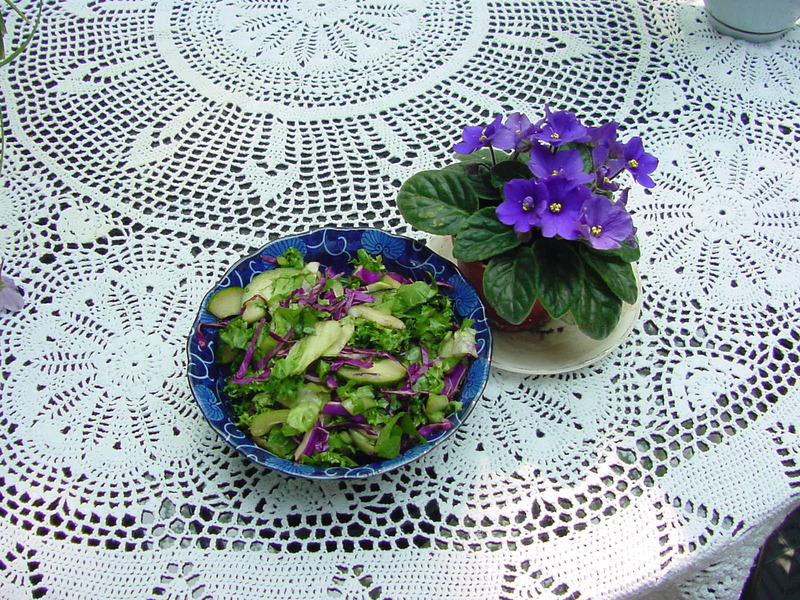 When ready to serve, add one tablespoon of umeboshi vinegar diluted in a little water. mix well and serve. Cut the green leaf along the middle line, removing the hard stem, stack the cut leaves up on each other facing the same direction. When you have a good size pile, cut leaves in diagonal thin strips going along the leaf veins. Bring the water to a rolling boil to generate a good amount of steam Place the cut collards in the steamer. Cook for 3 minutes, add shoyu on the greens, continue to cook one more minute and Serve. Bring apple juice to a boil then add the fruit and quickly return to a boil. Completely dissolve 1 tablesp. Kuzu in 2 tablsp. 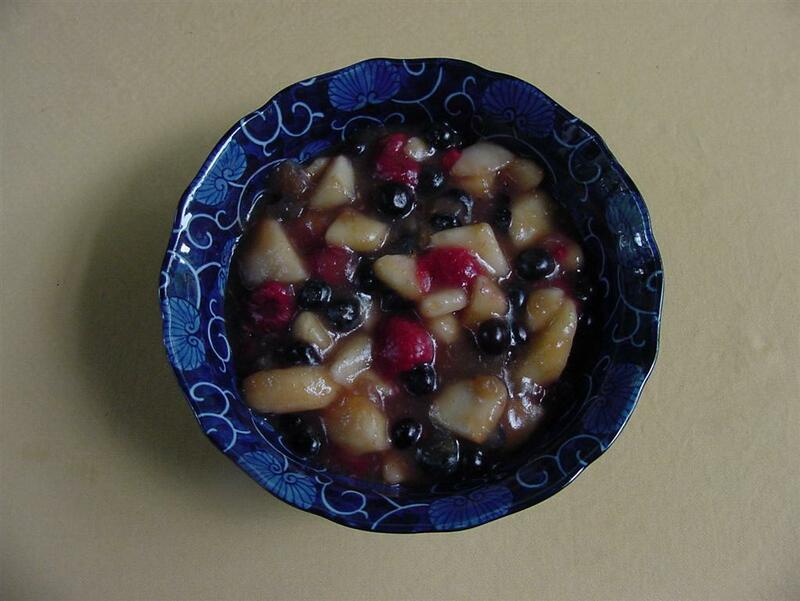 cold water and add to the fruit while stirring constantly. If the mixture is too thin, dissolve and add more Kuzu until desired thickness If it is too thick, add small amounts of apple juice until you get the right creamy consistency. Serve either warm or chilled.